documents, etc., for the purpose of preparation of Select List / Wait List pursuant to the vacancies notified in the detailed advertisement dated 29/10/2018, 3rd Centralized Recruitment Process for the Post of PEON (CLASS-IV) including Chowkidar/Liftman/Water Server/Home Attendant – Domestic Attendant/Jail Warder/Sweeper on the establishment of the Subordinate Courts in the State of Gujarat. SELECT LIST of Candidates for Recruitment to the Post of HAMAL, CHOWKIDAR, LIFTMAN &PEON on the establishment of the High Court of Gujarat. WAIT LIST of Candidates for Recruitment to the Post of HAMAL, CHOWKIDAR, LIFTMAN & PEON on the establishment of the High Court of Gujarat. There are lots of people who are not properly educated but still want to do government job. So Here is the opportunity for them to serve government as class 4 servant. Gujarat High Court Recently Announced the Recruitment notification to hire class 4 servants for the post of hamal, chowkidar, liftman, Water Server, Home Attendant, Sweeper, Jail Warder. They have announced it in the 2 websites (hc-ojas.guj.nic.in & www.gujarathighcourt.nic.in) and in the news papers. Application forms can be fill up online through hc ojas portal which can be accessible using below given link. 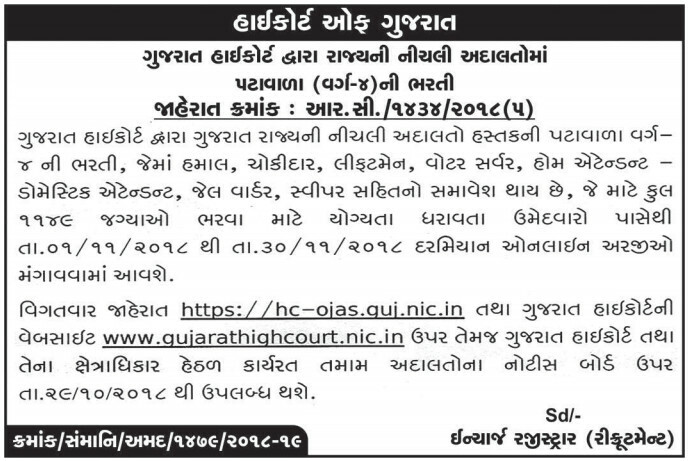 High Court of Gujarat Published Advertisement Number R.C/1434/2018(5) for Latest Class-4 Bharti in Court. Official Jaherat will be Published on 29th October 2018 on its Website. Kindly Bookmark this Page for More Updates. This notification is also available on gujarathighcourt.nic.in and the advertisement number is RC./14342018(05). If you are facing any kind of problem in searching for the details of this specific recruitment then you can simplify your search by entering Advertisement No. Required Education Qualification : Candidate should be 8th pass from the government approved school. Minimum and maximum age limit : Minimum Age should be 18 years and maximum age to apply online is 35 years as on 30-09-2018. Find out Recruitment tab and select it. Navigate to the link Advertisement for Recruitment of hamal/ chowkidar/ peon/ . Download the Official Notification as PDF and read it thoroughly. Find the Application Form at bottom of Notification and take printout of it. Fill up the Application Form hard copy with personal, communication and educational details. Pay the Examination Fee of Rs.300/- by Treasury Challan. Application fee is 300/- Indian Rupees for general category candidates, But if candidates belongs to other sc/st/obc category then they need to pay 150/-rs only. Application fees could be payable online and offline. If you want to pay it online then you can use debit card / credit card / net banking. Please save hard copy as well as soft copy of the receipt because you can not generate it twice. If you want to pay application fee offline then print challan and pay it to your nearest SBI Branch before the last date of submitting application fees. Bank will take one copy of challan and second copy will be given to you. IMPORTANT: It is necessary to pay challan on State bank of india only. The Challan paid on other banks will not be acceptable. Exam date can be change as per the need of gujarat highcourt. It is only probable date of written examination for hamal chokidar peon and lift-man post. The exam call letter can be downloadable from the official websites of gujarat highcourt which is gujarathighcourt.nic.in and hc-ojas.guj.nic.in. Call letter will be available before the 1 week of the examination. Last date of downloading call letter will be the day before exam which is 15-12-2018. 11=pas .jignesh giri haresh Giri. Gundiyali mandavi kutch. Hamal chokidar. Some errore was occurred when I submitted form. How can is fix it? I have finished my graduation in 2019 with English subject. So any other job plz informa me .